▶︎ Space-saving design in strong transparent acrylic, for a lighter, uncluttered storage solution. The slim design takes up very little room, yet provides plenty of storage space. ▶︎ The Grade A acrylic will never peel, rust or tarnish, and can be used in any room in the house, including kitchens and bathrooms. They fit perfectly under sinks and over toilets and are ideal as shower shelves. ▶︎ Every shelf is carefully crafted from a single piece of highest grade acrylic for a very strong, sturdy, yet sleek design. Designed to be practical, each 15 inch shelf has plenty of storage room for items up to 3 inches wide. ▶︎ Each Set contains two individual wall mount shelves so you can arrange them tiered, side by side. Simply add more shelves for extra storage if you need it. *Not suitable for mounting on back of doors. NEW optional glue-on ends included in package! NEW! 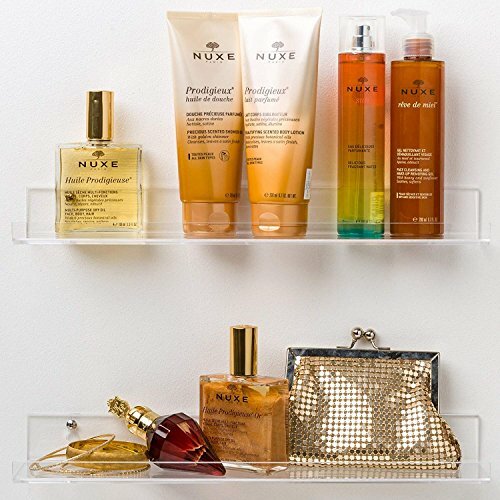 Versatile, Slim & Space-Saving Wall Mounted Acrylic Shelf Set. Super easy to install, with stainless steel fittings included. Solid, Sturdy, 5mm Thick, Grade A acrylic is safe, secure and maintenance-free. Acrylic is the ideal choice for damp or steamy areas as it never rusts, peels or tarnishes. The generous 3 inch ledge fits all your cosmetics, perfume, shampoo & accessories, and is perfect for shaving tools. Versatile storage shelving and the small, neat size fits plenty of bottles and jars, giving you back tons of room on your work space, cupboards, countertop and in your drawers. Use anywhere in the house. The Ultra-Clear acrylic is perfect to display your books, spices, pictures, memorabilia and collectables, and of course the "invisible" clean unobtrusive design matches every Décor in your kitchen, bedroom, pantry, which is the #1 choice if you are buying as a gift. Mount above the sink, behind the bath, for over the toilet storage, and because they don't corrode they are perfect as shower shelves. These organizer shelves look great in a single row or as a 2-tier rack. Best as a kids bookshelf or small toy holder. Optional Glue-on ends included. If you have any questions about this product by Pretty Display, contact us by completing and submitting the form below. If you are looking for a specif part number, please include it with your message.